artumn: "We float like two lovers in a painting by Chagall"
"We float like two lovers in a painting by Chagall"
Marc Chagall, Above the Town, 1887, oil on canvas. I’m a big fan of The Weepies. Their song, Painting by Chagall, has always struck me as romantic and raw but I’d never seen in any work by Chagall so the exact meaning and symbolic nature of the song I was unsure of. Beautiful and idyllic without Chagall’s painting in mind, Above the Town makes the lyrics all the more enchanting. The two lovers in the painting could be on their way to elope or simply on a voyage on the gusts of love. Either way, it’s all equally charming to me. Maybe even wishful thinking. But that’s what Chagall’s paintings were all about. Chagall was known for capturing somewhat whimsical scenes. This painting touches on the essence of childhood with simple lines and warm colors while still carrying an air of complexity with the mere subject matter of two lovers. 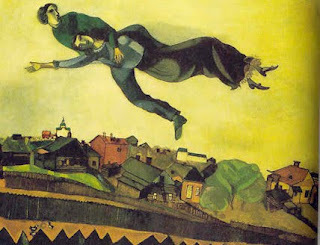 Who knows, maybe Chagall was trying to say that love can make you feel like a kid; free. And who wouldn’t want that?